In her 1984 book, Portsmouth, Island with a Soul, Dorothy Byrum Bedwell writes about the serenity of Portsmouth in the 1930s. Today Portsmouth is at least as quiet, probably more so since cattle no longer graze there, and no one lives in the once bustling village. Click on the photo below for more information about Portsmouth Island. 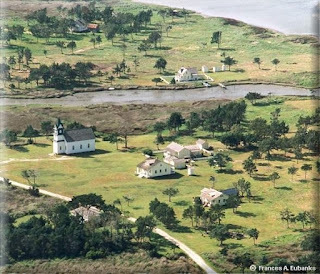 This month's Ocracoke Newsletter is a transcription of a letter describing the September, 1944, hurricane, its aftermath and cleanup. You can read the letter, with vintage photographs added, here: www.villagecraftsmen.com/news102117.htm. It's rather curious that the lighthouse was decommissioned and the post office was closed in 1959. USPS has been closing post offices for the past 60 years. Now PI was placed on the National Historic register in 1971. Something isn't just 'placed" on the register, an application has to be made and the FOI act would certainly allow access to what was behind that action. Why did OI survive while PI declined? If it was a popular point of entry back then what is to prevent continued use of this point of entry by undesirable parties? Public comment is open regarding increa==sed fees to visit National Parks If a smart person donates to their local PBS station it would be even smarter to purchase an annual pass to visit an unlimited number of parks. If those that can afford and want to support National Parks for tomorrow when you visit --it will call attention to the Plight and the Underfunding of our most precious resource OUR National Parks. If an annual pass tells number crunchers something get their attention and buy an annual pass every year for the rest of your life. Portsmouth Island declined for a number of reasons. Many left when Union forces threatened the island during the Civil War. Hurricanes of 1899, 1933, and 1944 did considerable damage. And Ocracoke got roads, electricity, and ferry service that revived the economy as Portsmouth declined. Portsmouth never had a lighthouse. Portsmouth is now part of Cape Lookout National Seashore; thus its inclusion in the National Register.